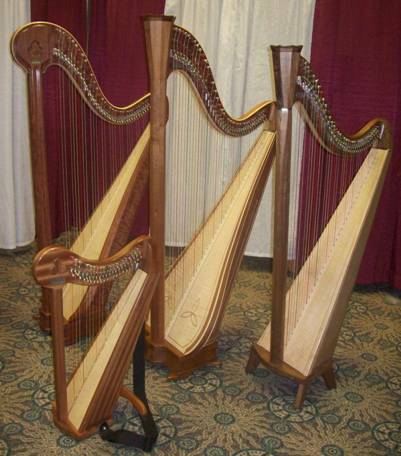 We presently have five models of lever harps, in different sizes and price ranges. Click on the picture or title to learn more about each. 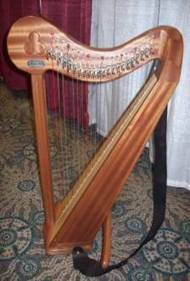 All our lever harps use standard concert harp strings, and have fairly high tension for better sound and a lively response. We use our own machined brass and nickel-plated string eyelets in the soundboard to transmit more directly string vibrations to the soundboard, thus enhancing response and sustain. All our soundboards are made of veneered, select Sitka Spruce, and are constructed just as are traditional pedal harp soundboards. 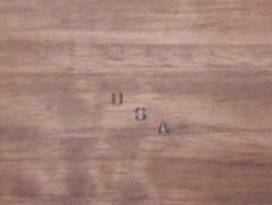 Soundboard tapering (bottom to top, and center to side) is kept within a tolerance of .005”. 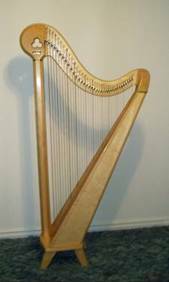 The string length is nearly the same for the same notes on all of our harp models, and the string spacing is very close to that on traditional pedal harps. 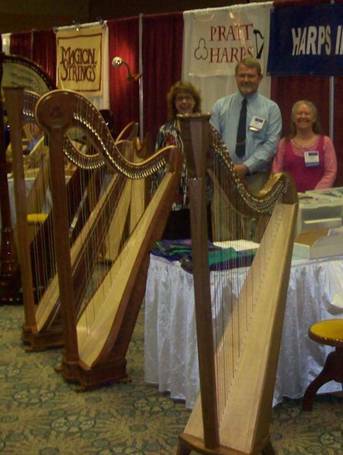 All our harps use Camac sharping levers, which are unequivocally the best available at the present time. 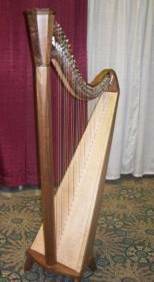 Our 36 and 38 string instruments are well-balanced when held in playing position, and are not heavy on the shoulder. Our instruments have a three-sided flat-panel body instead of a rounded body design, as this helps the body to resonate more and contributes to the excellent sound of our instruments. 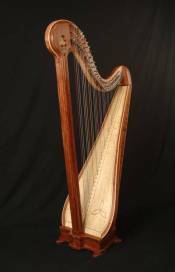 The back corners of this faceted body design are considerably rounded, thus having no discomfort for the harpist as the instrument leans against the right shoulder. We do not use any stain on any of our instruments to achieve particular colors or finishes, but prefer the natural look of unstained wood. 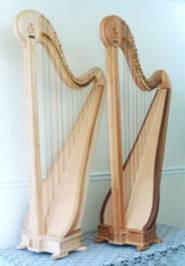 We offer each harp in different finishes, with colors or finishes achieved through natural colors and textures of a variety of different hardwoods and hardwood veneers. Our instruments are finished in a hand-rubbed lacquer, and buffed to a satin finish. This lacquer finish is the best finish for easily repairing minor blemishes which may occur over time. The fact that we do not use any stain also makes repairs to the finish much easier to accomplish, should this ever be necessary. If you desire the best in hand crafted instruments, then we can serve you. We also do custom finishing, and special request for our instruments. 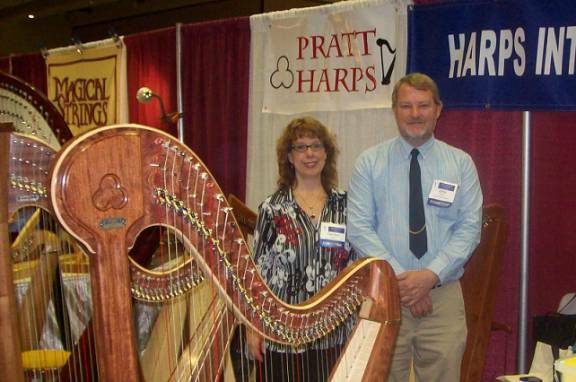 Inquire also for repairs of other makes, as we do virtually all repairs on other brands of lever and pedal harps.